I find a lot of coaches are terrified of rejection. Some even totally avoid the official invitation to begin a coaching relationship because they’re so afraid of that little two letter word. My guess is that most coaches have never even heard the word because of how well they avoid asking potential clients if they’d like them to coach them. So today, I want to take the fear of the “no” away, because no doesn’t even mean what most coaches think it means. It’s not a rejection. It’s nothing personal. And I’ll give you a hint, out of the 4 reasons, none of them are ever about the money. So here’s what they are, and here’s how we switch that 75% to YES! REASON #1: We’re not a good fit. This is the most legitimate reason why we don’t enter into a coaching relationship. And this “no” actually goes both ways. 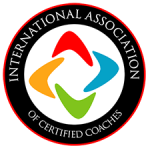 For the client, if they’re not feeling the chemistry, it’s highly unlikely that coaching skill alone is going to entice them to enter into a coaching relationship. As coaches, we have to be okay with this. Not everyone is going to connect with us on that level. For you, the coach, sometimes the client has all the feels about you, but the feelings aren’t mutual. The best thing that you could do is not enter into a coaching relationship with that individual. As a matter of fact, it’s immensely important for you to develop a value system that’s so high, that you do nothing out of a need for money or of the fear of rejecting the individual. You’re not responsible for how they react to your no, but you are responsible for allowing them to continue their search for a coach who is a better fit for their needs. This is one of the values I really work hard to build into our Jumpstart coaches. I tell them: just because you could coach anyone doesn’t mean you should. The main reason why we choose a target market is there are some people with whom we will do our best work. We choose the kinds of people we have chemistry with, who motivate us, and who we look forward to seeing on a weekly basis. It’s a disservice to both you and the client if you really don’t both enjoy the person you’re coaching or don’t believe in them and what they’re going after. REASON #2: The relationship hasn’t matured. There are many potential clients out there, and I love the fact that the majority of coaches don’t approach getting clients by being salesy. But I’m afraid, even though coaches are relational beings who don’t use sales tactics, they still don’t embrace the fact that someone signing on as a client is not a sales transaction. This means meeting you at a networking group one week doesn’t mean they’re going to become a client the next month. I find this is the biggest hindrance for coaches who are using online marketing to gain their clients. They think running Facebook ads or daily posting multiple image quotes on Instagram is the key to getting clients, and they wonder what they’re doing wrong if it doesn’t happen within a week or two. To this, I tell all coaches that, like any relationship, they have to treat everything they do with some patience. Sometimes people really love us, and we make an immediate connection and they become a client nearly instantaneously. Other times, it takes a bit longer. How long? I don’t know really because every relationship is a little bit different. Do you notice that expertise is actually the least amount of the pyramid? A coaching relationship really comes out of these two primary factors: trust and likability. Likability can come pretty fast. Trust may take a little more time. If these things haven’t been developed, you can bet you’re going to get a “no.” But this sort of no is more like a “not just yet.” You see, sometimes in relationship, we like someone when we meet them, and it triggers this desire to get to know them more. So think of this as earning the right relationally to ask them to enter into a coaching relationship with you. And here’s a hint: the stuff that we naturally do as coaches – listening, being curious, asking questions, making room for others, etc. 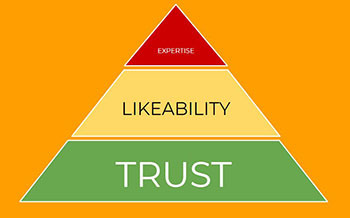 – makes you likable and trustworthy. REASON #3 I didn’t show them the benefit and value my coaching could bring them. Coaches waste too much time talking about what coaching is with people and not enough time showing them what coaching is. Let me repeat myself again: you can’t sell coaching, because it’s not tangible. So spare everyone the definitions and comparisons of coaching, and you’ll be doing everyone – including yourself – a huge favor. Don’t schedule meetings to discuss coaching either. That’s a complete waste of time. Instead, set up actual coaching experiences. These can be called complimentary sessions, discovery sessions, exploratory sessions, etc. – whatever you call it, blow their minds with extraordinary coaching. Coaches who get “no’s” didn’t reveal the value of their coaching and didn’t show the potential client how it could benefit them. They probably just talked about coaching, or they gave the potential client a “complimentary coaching session,” which really turned out to be a great conversation where no real coaching took place. In Jumpstart Your Coaching Practice, we give our coaches a process that we call “The Explosive First Coaching Session.” It’s designed to show you how, in 30 mins to 1 hour, a coach can quickly progress the initial coaching session into real actionable steps that is stunning in its effectiveness to reveal value and benefit. REASON #4: They haven’t hit critical mass. Here’s the deal: sometimes you’ve earned trust, they like you, you’ve shown the value and benefits on what you do to the potential client, but the timing just isn’t right. This is all about urgency on the part of the potential client. Timing means that the potential client has gotten to a critical level with regard to what they desire. There simply has to be a high level of urgency on the part of the individual to finally step across the line and do something different than what they’ve been doing. Sometimes this urgency can be enhanced through trust building (and an explosive first session definitely doesn’t hurt), but ultimately making a change is up to the individual. As a coach, you can’t want change more for the client than they want it. I understand what it’s like to look at so many people with extraordinary potential that we could help, but, for some reason, they don’t want to help themselves. It’s frustrating, I know. But everyone has their own process. Some are ready to go immediately. Some may be in your pipeline for 6 months or more. But that’s okay, because you know what your focus is right? You keep building trust, likability; you keep serving. You DON’T give away more than one free session, but, when they are ready, you’ll be the one they’ll turn to. I keep individuals like this at a reasonable distance. I don’t take this as a “no,” I take is as a “not now, maybe later.” I just schedule light touches, so they know I’m still here, but there’s no pressure. That touch may be in the form of a text every now and then, or it might be an email sharing an article that I think might encourage them. This lets them know that I’m thinking about them and not just interested in selling them. I really do value them, and I’m going to stay in touch. Of course, this makes them think of me too. What’s really cool about these individuals is, in the meantime, they often will send you clients.